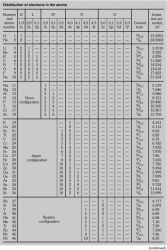 Insofar as they are known from spectroscopic investigations, the electron configurations characteristic of the normal or ground states of the first 103 chemical elements are shown in the table. In the next-to-last column of the table, the spectral term of the energy level with lowest total electronic energy is shown. The main part of the term symbol is a capital letter, S, P, D, F, and so on, that represents the total electronic orbital angular momentum. Attached to this is a superior prefix, 1, 2, 3, 4, and so on, that indicates the multiplicity, and an anterior suffix, 0, 12, 1, 32, 2, 52, and so on, that shows the total angular momentum, or J value, of the atom in the given state. A sign ° above the J value signifies that the spectral term and electron configuration have odd parity. The orbital and spin arrangement of an atom's electrons, specifying the quantum numbers of the atom's electrons in a given state.